New Jersey Devils at New York Rangers: Who can remember the last time these two bitter rivals were relevant? We may have to reach back to the prime of Patrick Ewing’s career. We are living in the now though. And though New Jersey is not a top-tier team, they still are capable of making noise in the postseason. The Rangers on the other hand are looking to bring back some Mark Messier type of memories. 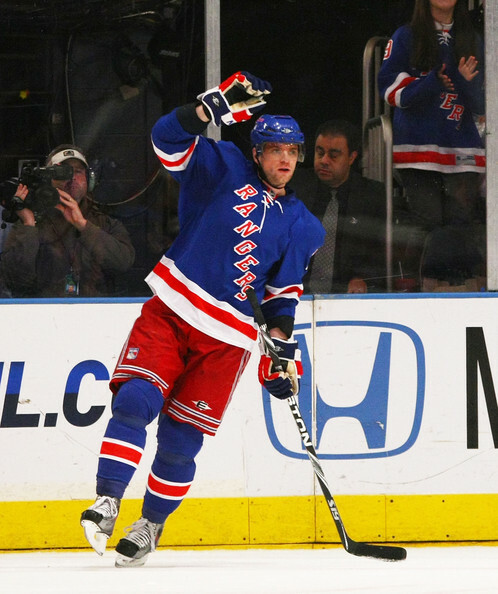 Perhaps Marian Gaborik can help make this a reality? Both of these rivals are coming off of a loss. Something that has been a rarity for the Rangers this year. Don’t get used to it though. Not only are the Rangers one of the NHL’s best teams, they also are one of the best at home. Tonight, they will defend their home ice. 4. Who doesn’t love when a two-team race turns into a three-team race? In this case, I am assuming that anyone associated with the Titans or Broncos are likely unhappy, but everyone else is enjoying the ride (49ers are in the running now for Peyton’s services). The “Peyton Manning Sweepstakes” continues on. And I must admit that I am not in the least bit annoyed by all of the attention focused on this story. Maybe the amazing weekend of “March Madness” provided a shield that prevented this story from becoming sickening. Who knows how I will feel next week if the sweepstakes are still going on though. 3. Isner slayed the giant that is Novak Djokovic. American tennis is back baby (well not exactly yet). And Roger Federer continues to show that great champions can age gracefully. Indian Wells was awesome, but all of the best players on the globe head to Miami this week for the Sony Ericsson Open. South Beach will be bringing the heat for the next couple of weeks. 2. The trade deadline came and went with a mild bang. And finally, the Dwight Howard version of “Gossip Girl” came to an end, or at least for a year. Thank god. Now we can focus on the stretch run and start to get ready for the playoffs. My matchup of the week is set to take place in Orlando. Chicago Bulls at Orlando Magic: Two of the East’ elite collide at the Amway Center tonight. So much for a break for the Magic from the constant worrying. Dwight Howard decides to stay, at least for the time being, and Orlando gets to play Miami and then Chicago on consecutive nights? Is this really fair? This is where the men are separated from the boys. Now Orlando is a very solid team at home that beats the majority of their opponents with good old-fashioned rebounding and defense. Sadly for the Magic, Chicago does both of these things better, and are the NBA’s best road team. Also, the Bulls feature one of the League’s elite offenses. With or without Derrick Rose, I expect the Bulls to exert their dominance with a huge road victory. 1. Upset city baby! It’s a dipsy-doo dunk-a-roo. Okay, you can sleep now. Two 15 seeds win on the same night? It was a Friday for the ages to say the least. The first weekend of March Madness started out slow, but by the end, lived up to all of the hype and more. Who else needs a breather? I know that I do. Rest up, because the second weekend of the “Madness” is sure to provide some more fireworks as well. This entry was posted in Miscellaneous and tagged Chicago Bulls, Denver Broncos, Derrick Rose, Dwight Howard, Indian Wells, John Isner, March Madness, Marian Gaborik, Mark Messier, NBA, NCAA Basketball, New Jersey Devils, New York Rangers, NFL, Novak Djokovic, Patrick Ewing, Peyton Manning, Philadelphia Flyers, Pittsburgh Penguins, Roger Federer, San Francisco 49ers, Sidney Crosby, Sony Ericsson Open, St. Louis Blues, Tennessee Titans, Vancouver Canucks. Bookmark the permalink.